I'm using a Ubuntu 12.04 install with the elementary-daily ppa. Pantheon is my default session, and gala the default window manager. 3 days ago, on a normal update from the elementary ppa, I've got a good crash in my system: all the windows lose the top bar (the one with window title, maximize and close), the plank (the elementary's default dock) and wingpanel are all messed up, with a great black retangle around they. 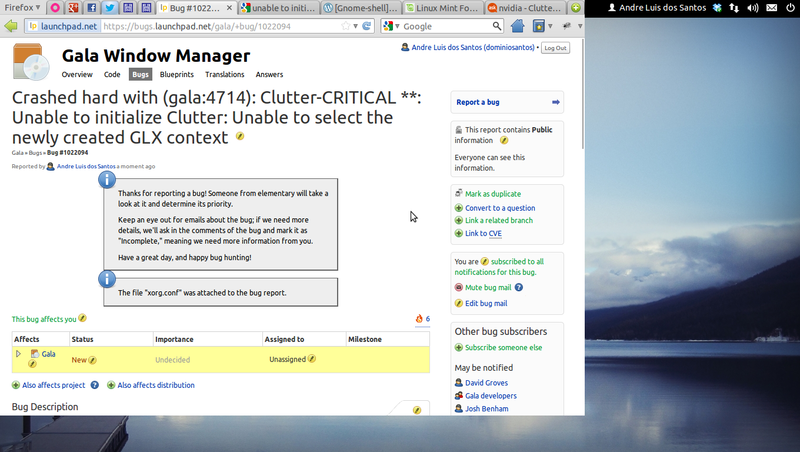 Erro do gerenciador de janelas: Unable to initialize Clutter. The "Erro do gerenciador de janelas" means "Window Manager Error" in Portuguese (my system's default language). I dunno what to do, received another update today, but the crash remains. All my windows are without borders and controllers (close, maximize, etc. ), I can't use Alt+Tab to change between them, and the session is unusable. Tried to "compiz --replace" but got a lot of errors and no changes. Also, when I go to Unity (bah!) session, the desktop works normally, with compiz as the default WM, so I think the problem is not with my driver... Both 3D and 2D Unity sessions work. Intel Pentium D, 3GB RAM DDR2, GeForce nVidia 7300 LE (with the proprietary drivers). I've attached my xorg config file. It looks so strange and has no borders because gala didnt start at all. I guess it was introduced with the recently added updated snapshots of libmutter. Could you run "mutter --replace" to be sure? When I tried to "mutter --replace", ubuntu warned me I didn't had mutter installed. So I did an apt-get install mutter. Please post output of "apt-cache policy mutter" and "apt-cache policy gala" so we can tell if the problem is in Ubuntu's Mutter or in the Mutter to which we've cherrypicked upstream improvements. Cool, it's the version with our cherrypicks. Thanks. Same problem here. I can't use eOS. Tryed compiling the latest gala from bzr, but same thing. Can you try running gnome-shell? I'll reinstall it using the latest x64 daily build. Then i'll try later today with gnome shell. Well, i'm on it now. But i get some errors while trying to update Gala. It says gala depends on libmutter0-elementary2, but its caiming only the libmutter0-elementary1 is available. So it could not install Gala, and therefore i have can't start Pantheon-Session. Any ideas? using Luna (no ubuntu), and all the default's repos. This was actually fixed a bit ago. A apt-get update should (hopefully) do it. Just a addendum: I have problem with the last update to the kernel (3.2.29). Keep getting Panics. They don't seem to happen with 3.2.27, so i'm sticking with it for some time. Seems to be a Ubuntu related problem, since you guys use it as base. That's a know and reported problem, unistalling ulatencyd will solve it.